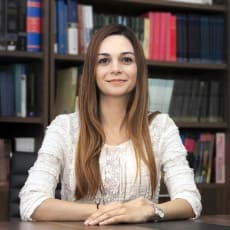 Anna Charalambous-Katsaros graduated from the law school of Aristotle University of Thessaloniki in 2009 and has been a member of the Cyprus Bar Association and the Nicosia Bar Association since 2010. She is a manager-advocate in the law firm A & E C Emilianides, C Katsaros & Associates LLC. Her main areas of expertise and practice relate to labour and employment law, commercial and corporate law, banking and finance, real estate law and dispute resolution. During her years of practice, Mrs Anna Charalambous-Katsaros has represented employers and employees in various employment litigation cases. In addition, she has extensively advised clients on the full spectrum of employment law matters. Mrs Anna Charalambous-Katsaros is fluent in Greek, English and French.